Get ready with me (μακιγιάζ και τι φόρεσα) + bonus live performance! Some of you know it while others don't know that I'm a singer at a band! I've been singing in bands for the past 5-6 years and I love it, although we were mostly rehearsing and did very few gigs. With my newest band we've been together for about a year and last Saturday we did our first gig, which was at a terrace party in Athens. I enjoyed it immensely and I really hope that there will be more live performances from now on! We do weekly rehearsals usually on Wednesdays and two days ago I decided to make a video while I was doing my make up and show you what I wore. I love watching "Get ready with me" videos, because it's like being in a room with your girlfriends and you are all getting ready to go somewhere, which is usually crazy, but also fun! At the end of the video there is a little medley of our last live performance so you can all have an idea of what we're all about!!! Συνήθως κάνουμε πρόβες κάθε Τετάρτη και έτσι πριν από δύο μέρες που ετοιμαζόμουν για την πρόβα, σκέφτηκα να κάνω ένα βίντεο και να καταγράψω το μακιγιάζ και το τι φόρεσα. Απολαμβάνω να παρακολουθώ τα "Get ready with me" βίντεο, καθώς μου θυμίζουν φάσεις ετοιμασίας με τις φιλενάδες μου, όταν έχουμε να πάμε κάπου όλες μαζί, όπου φυσικά επικρατεί πανικός, αλλά είναι και τόσο διασκεδαστικό! Στο τέλος του βίντεο θα δείτε ένα μικρό ποτ-πουρί από την τελευταία μας live εμφάνιση, ώστε να έχετε μια ιδέα ποιοί είμαστε και πως ακουγόμαστε (αν και ο ήχος μας αδικεί αρκετά λόγω της πρόχειρης καταγραφής του με το ipad!). Hello again my lovelies, this is a Haul/review post and it's going to be a long read, since I got quite a few products. So grab a cup of coffee and start reading or watch the video (if you speak Greek)! Γειά σας my lovelies, αυτή είναι μια ανάρτηση Haul/review και είναι σχετικά μακροσκελής, γι' αυτό πάρτε το καφεδάκι σας και ξεκινήστε το διάβασμα ή αν βαριέστε δείτε το βίντεο! 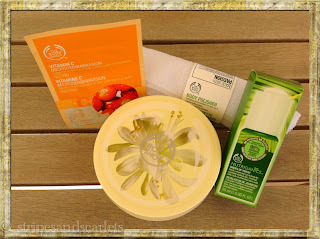 In June I visited The Body Shop store in Piraeus and bought a few things. 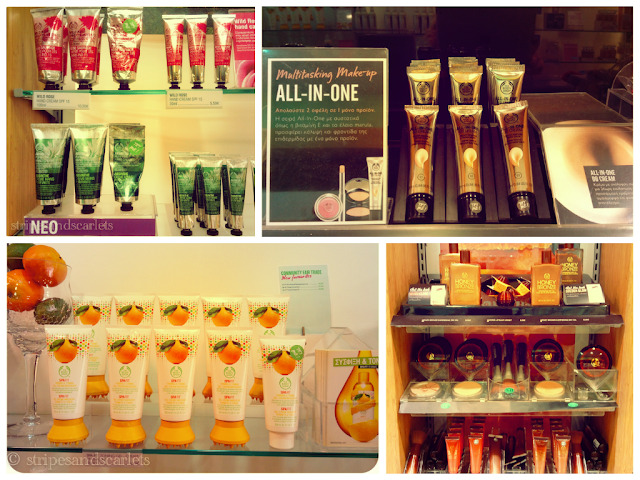 I also got several samples and a mini face treatment by the lovely Depy, store manager. The treatment consisted of make up removal with the Nutriganics Gel cleanser, a mild scrub witch I really can't remember what it was, followed by Aloe protective restoring mask. She left the mask on and didn't remove it, so it would work its' magic. Afterwards, she applied some cream compact foundation, a bit of contouring with loose powder foundation and I put on a red lippy so I could leave the store and not scare anyone on the street with my bare face! Τον Ιούνιο επισκέφθηκα το κατάστημα The Body Shop στον Πειραιά και αγόρασα μερικά προϊόντα. Πήρα επίσης αρκετά δειγματάκια και η γλυκύτατη Ντέπη, store manager, μου έκανε μια μίνι περιποίηση προσώπου. Η περιποίηση ξεκίνησε με ντεμακιγιάζ με το Nutriganics Gel cleanser, καθώς ήμουν μακιγιαρισμένη (ως συνήθως). Μετά ακολούθησε ένα απαλό scrub αλλά δυστυχώς δεν θυμάμαι ποιό προϊόν χρησιμοποίησε. Στη συνέχεια μου τοποθέτησε την Aloe protective restoring mask, την οποία δεν αφαίρεσε, ώστε να κάνει τα "μαγικά" της στο δέρμα μου. Από πάνω μου τοποθέτησε λίγο από το cream compact foundation, μου έκανε ελαφρύ contouring με μαι πιο σκούρα απόχρωση από το loose powder foundation και έβαλα κι ένα κόκκινο κραγιονάκι, ώστε να μπορώ να κυκλοφορήσω χωρίς να τρομάζω τον κόσμο! Nutriganics softening cleansing gel: it's an organic product. Contains no silicones or parabens. It's a gel to oil cleanser that removes impurities and even waterproof makeup gently and easily. It feels oily although it is a gel but the good thing is that it can be removed with just water. It's a great makeup remover but it hurts my eyes. I would definitely use it for my face but not for my eyes because it stings like hell! Nutriganics smoothing day cream: It's an organic product that has been created for the first signs of aging. It hydrates for up to 12 hours smoothes the appearance of fine lines and wrinkles and revitalizes skin. It feels rich but not greasy, it is easily absorbed but after a while it makes me oily. Also I consider it a negative that there is no SPF. Nutriganics Smoothing night cream: an organic product that has been created for the first signs of aging. It hydrates, softens and smoothes skin while you sleep, while reducing the appearance of fine lines and wrinkles. It has a rich texture it is not very easily absorbed and I generally don't like the way it feels on my skin. When I was using it after drops of youth, I felt like it's not doing it any justice. I don't think it's suitable for my skin. Drops of youth: Contains criste marine plant stem cells and beech bud extract. It evens skin tone and makes it smoother fresher and more healthy. Stem cells have anti-aging properties and they improve skin's elasticity, they promote wound healing and preserve lipid structure. It feels nice on the skin and you actually feel your skin a bit taut after application. It is easily absorbed and it does improve skin's texture and tone. Vitamin C daily moisturizer SPF 30: It enhances skin's natural radiance, hydrates and protects from UVA and UVB. It makes skin bright and radiant and leaves it feeling soft and smooth. It does make it radiant alright...but from oiliness. It smells lovely, it feels nourishing and it did a good job protecting my skin within city limits but at the beach it didn't do much I'm afraid. It's too oily for my skin unfortunately. Ενισχύει τη φυσική λάμψη του δέρματος, ενυδατώνει και προστατεύει απο τις ακτίνες UVA και UVB. Κανει το δέρμα φωτεινό και λαμπερό και το αφήνει απαλό. Όντως το κανει λαμπερό...απο λιπαρότητα! Μυρίζει υπέροχα, τη νιώθω θρεπτική και με προστατεύει επαρκώς για μέσα στην πόλη (στη θάλασσα δεν έκανε καλή δουλεια παρόλο που δεν έβρεξα το πρόσωπο μου). Αλλα ειναι πολυ λιπαρη για το δικό μου δέρμα...δυστυχώς. Vitamin C Micro dermabrasion: Fine exfoliating microparticles and crushed garnet stones remove dead cells leaving skin bright radiant and soft. It also improves skin's texture. Indeed it does as it says and although it's not supposed to be suitable for sensitive skin it didn't bother me at all. I wouldn't recommend using it more than once a week and also you should be careful not to rub too hard. 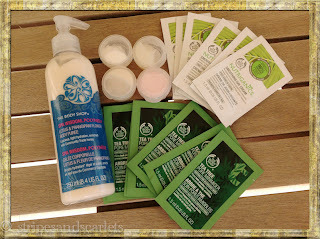 Teatree pore minimizer: This is supposed to make pores appear smaller. It contains tea tree oil, mattifies the skin and leaves it feeling fresh and pure. It also serves as a primer. It does make skin feel fresh and the smell of tree oil is revitalizing, but it could be quite intense for people that are sensitive to fragrance. Unfortunately though it doesn't do anything about pores. It mildly mattifies skin and improves its texture, but does nothing more. I was really hoping it would work, but it didn't. Peppermint intensive foot rescue: It is an overnight treatment for dry heels. It softens hard skin on the feet, it hydrates them and helps to combat odour. Its consistency is rich, without being oily. It has a pleasant smell and softens the skin even if you haven't had your feet pedicured. I would definitely buy it. Polynesia lotus and frangipani body purée: It has a pleasant smell from lotus and frangipani, a tropical plant. It is easily absorbed but it's not as hydrating as I would like it to be. Maybe I just prefer a richer cream. Έχει ευχάριστη μυρωδιά απο λωτό και πλουμέρια ενα τροπικό φυτό. Απορροφάται εύκολα, αλλά δεν ειναι τόσο ενυδατική όσο θα ήθελα. Ίσως προτιμώ τις πιο πλούσιες κρ'εμες. 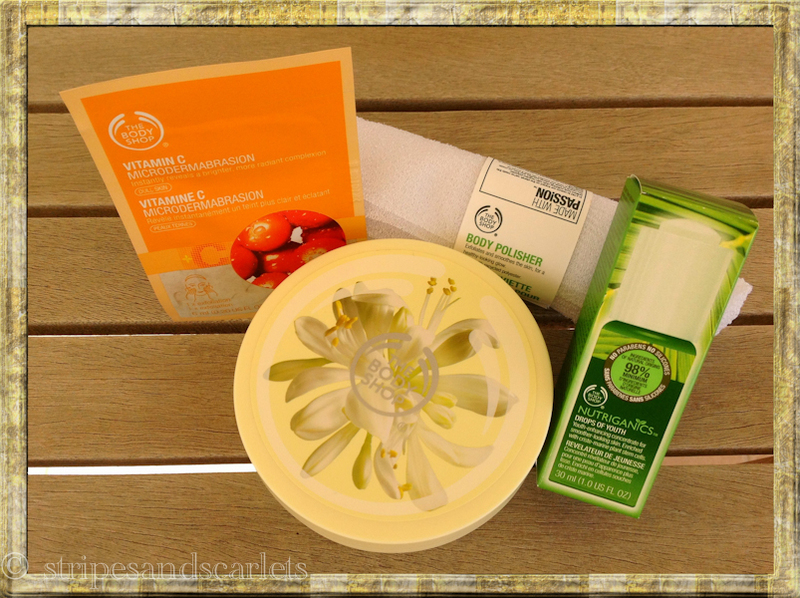 Moringa body butter: We all know The Body Shop's body butters. My favorite is the coconut one but unfortunately it was sold out so I chose moringa. I love the fact that hydrates up to 24 hours, you feel the skin soft all day and the fragrance lingers. Moringa besides having a lovely fragrance it is also used in cosmetology for its antioxidant properties. But it's not just for external use. It is considered a hyper food since it has a high protein content, eight essential amino acids and a broad spectrum of vitamins and inorganic elements. Some other products that caught my eye: I love the vintage packaging of the hand creams and my favorite is the Wild Rose. Next, the All in one BB creams, which I would love to try, but even the lighter shade is too dark for me!